Anonymous administration officials, various reporters, and the right-wing noise machine concoct a false history to blame Chris Dodd for the AIG bonuses. There is a major push underway -- engineered by Obama's Treasury officials, enabled by a mindless media, and amplified by the right-wing press -- to blame Chris Dodd for the AIG bonus payments. That would be perfectly fine if it were true. But it's completely false, and the scheme to heap the blame on him for the AIG bonus payments is based on demonstrable falsehoods. Jane Hamsher has written the definitive post narrating and indisputably documenting what actually took place. The attempt to blame Dodd is based on a patently false claim that was first fed to The New York Times on Saturday by an "administration official" granted anonymity by Times reporters Edmund Andrew and Peter Baker (in violation, as usual, of the NYT anonymity policy, since all the official was doing was disseminating pro-administration spin). 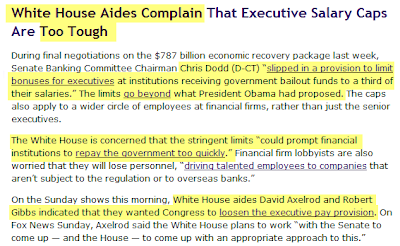 The accusation against Dodd is that there is nothing the Obama administration can do about the AIG bonus payments because Dodd inserted a clause into the stimulus bill which exempted executive compensation agreements entered into before February, 2009 from the compensation limits imposed on firms receiving bailout funds. Thus, this accusation asserts, it was Dodd's amendment which explicitly allowed firms like AIG to make bonus payments that were promised before the stimulus bill was enacted. That is simply not what happened. What actually happened is the opposite. It was Dodd who did everything possible -- including writing and advocating for an amendment -- which would have applied the limitations on executive compensation to all bailout-receiving firms, including AIG, and applied it to all future bonus payments without regard to when those payments were promised. But it was Tim Geithner and Larry Summers who openly criticized Dodd's proposal at the time and insisted that those limitations should apply only to future compensation contracts, not ones that already existed. The exemption for already existing compensation agreements -- the exact provision that is now protecting the AIG bonus payments -- was inserted at the White House's insistence and over Dodd's objections. But now that a political scandal has erupted over these payments, the White House is trying to deflect blame from itself and heap it all on Chris Dodd by claiming that it was Dodd who was responsible for that exemption. As word spread Friday about the new and retroactive limit -- inserted by Democratic Sen. Christopher Dodd of Connecticut -- so did consternation on Wall Street and in the Obama administration, which opposed it. Senator Dodd’s original executive compensation amendment adopted by the Senate did not include an exemption for existing contracts that provided for these types of bonuses. Because of negotiations with the Treasury Department and the bill Conferees, several modifications were made, including adding the exemption, to ensure that some bonus restrictions would be included in the final stimulus bill. At the same time, The Hill reported that "President Obama and the chairman of the Senate Banking Committee [Dodd] are at odds on how to rein in the salaries of top executives whose companies are being propped up by the federal government" and that "most of the administration's concern stems from the Dodd's move to trump Obama's compensation provisions by seeking more aggressive restrictions." Let's repeat that: the Obama administration was complaining because the compensation restrictions Dodd wanted were too "aggressive." But Mr. Reid mostly ducked a question about whether Democrats had missed an opportunity to prevent the bonuses because of a clause in the economic stimulus bill, part of an amendment by Senator Christopher J. Dodd, Democrat of Connecticut, that imposed limits on executive compensation and bonuses but made an exception for pre-existing employment contracts. That was the exact provision that Geithner and Summers demanded and that Dodd opposed. And even after Dodd finally gave in to Treasury's demands, he continued to support an amendment from Ron Wyden and Olympia Snowe to impose fines on bailout-receiving companies which paid executive bonuses (which was stripped from the bill at the last minute). But now that Treasury officials are desperate to heap the blame on others for what they did, they're running to gullible, mindless journalists and feeding them the storyline that it was Dodd who was responsible for these provisions. And today, during his White House Press Conference, Robert Gibbs advanced this dishonest attack by repeatedly describing the offending provisions as the "the Dodd compensation requirements." This is working because, as the White House well knows, Dodd is very politically vulnerable. He is a major target of the Right because of his genuinely questionable involvement with various banks, including his Countrywide mortgate, and this story (fueled by the fact that Dodd is a receipient of substantial AIG campaign donations), inflames those accusations. As predictable as can be, right-wing news outlets like Fox, Drudge and others have blown this Dodd story up today into a major scandal -- heaping blame for the AIG payments on Dodd -- and it was all started by Obama officials to ensure that no blame for these provisions was laid where it belongs: at the feet of Geithner and Summers. I'm not defending Chris Dodd here. As I said, there are all sorts of legitimate (though still unresolved) ethical questions about Dodd's personal financial matters. And if he were responsible for these compensation exemptions, then he ought to be blamed. But he simply wasn't responsible. He opposed them vehemently (The Hill at the time even noted that "Dodd is not backing down" from his opposition to the exemption that Geithner/Summers were demanding, and Jane has much more evidence, including the legislative history, conclusively demonstrating what really happened here). Geithner and Summers obviously thought that the exemption was justified when they were running around protecting those past compensation agreements, and they simply ought to explain why, rather than trying to sink Chris Dodd's political career in order to protect themselves. The only point here is that what the White House and many journalists are claiming simply did not happen. They're just inventing a false history in order to blame the politically hapless Dodd for what Geithner and Summers did. And they're being aided by a right-wing noise machine that knows Dodd is vulnerable and which views the opportunity to blame the AIG bonuses on him, probably accurately, as a final nail in his political coffin (Media Matters today details today the right-wing falsehoods in the attacks on Dodd by documenting that the claims against Dodd are inaccurate, but they don't say who was actually responsible for the exemption). The next reporter who writes a word about this or listens to anonymous White House officials blame Dodd for these provisions might want to spend a moment reading Jane's post and looking at the evidence showing what actually happened, rather than mindlessly writing down what Rahm Emanuel these anonymous White House officials are whispering in their ears. Speaking of The New York Times, that paper asked six legal experts to opine for its online edition on whether AIG would be able to evade the bonus obligations in its employment contracts. My contribution to their forum can be read here and the others can be read here. Almost uniformly, the contributions demonstrate just how frivolous Summer's Sunday excuse was for the payment of these bonsues -- that the sanctity of contracts left no way out. Having the White House blame Dodd (rather than itself) for this exemption is such a gross offense to the truth. But Mr. Reid mostly ducked a question about whether Democrats had missed an opportunity to prevent the bonuses because of a clause in the stimulus bill, that imposed limits on executive compensation and bonuses but made an exception for pre-existing employment contracts. Senator Christopher J. Dodd, Democrat of Connecticut, who initially proposed adding executive compensation and bonus limits to the stimulus bill, did not include the exception. Something in the last couple of hours caused The New York Times to change the way it is reporting this matter so that it is no longer mindlessly reciting the false White House attempt to blame Dodd for the bonus exemption, but instead is at least including a version of the truth. UPDATE III: I'm receiving email regarding the remarks Dodd made today on CNN in which he stated that, at the White House's insistence and over his objections, he agreed to include the pre-February, 2009 carve-out in the stimulus bill. Some of these emailers have suggested that Dodd's comments are at odds with what I wrote. They quite plainly are not. That was the exact provision that Geithner and Summers demanded and that Dodd opposed. And even after Dodd finally gave in to Treasury's demands, he continued to support an amendment from Ron Wyden and Olympia Snowe to impose fines on bailout-receiving companies which paid executive bonuses." I explicitly wrote that it was Dodd who, after arguing vehemently against this provision, ultimately agreed to its inclusion. And the statement from Dodd's office that I quoted above included the same series of events ("Because of negotiations with the Treasury Department and the bill Conferees, several modifications were made, including adding the exemption"). That's exactly what Dodd said today on CNN. The point was -- and is -- that Dodd was pressured to put that carve-out in at the insistence of Treasury officials (whose opposition meant that Dodd's two choices were the limited compensation restriction favored by Geithner/Summers or no compensation limits at all), and Dodd did so only after arguing in public against it. To blame Dodd for provisions that the White House demanded is dishonest in the extreme, and what Dodd said today on CNN about the White House's advocacy of this provision confirms, not contradicts, what I wrote. Dodd acknowledged his role in the change after a Treasury Department official told CNN the administration pushed for the language. Both Dodd and the official, who asked not to be named, said it was because administration officials were afraid the government would face numerous lawsuits without the new language. . . . I agreed reluctantly," Dodd said. "I was changing the amendment because others were insistent." It was the Treasury Department -- at least according to a Treasury official granted anonymity for the extremely compelling reason that he "asked not to be named" -- that pushed for the carve-out, and did so over Dodd's objections. That was the point from the beginning. That's precisely what made it so outrageous that the administration was trying to blame Dodd for a provision which Obama's own Treasury officials advocated, pushed for and engineered. Anyone who doubts Dodd's opposition should just go read the above-excerpted articles which reported contemporaneously about the dispute Dodd was having with the White House over the scope of the compensation limits. For obvious reasons, those real-time accounts are far more instructive about what really happened than what the parties are saying now that everyone is trying desperately to avoid blame for the politically toxic AIG bonus payments.